One of the exciting aspects of working with water media is the many effects that are possible by combining multiple techniques. This month I'm discussing two techniques that produce wonderful random results: using tissue paper and kosher salt. Both techniques add interest and variety to your work. The tissue adds depth by holding the paint in its creases. Salt is porous and absorbs the paint under it creating small star bursts. 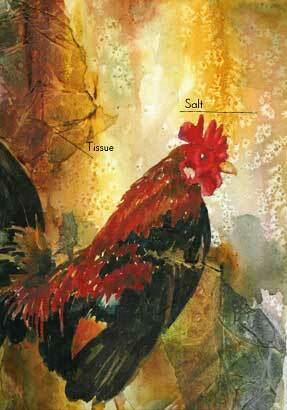 In the painting shown here, the entire background was painted before beginning work on the rooster. The end result is the subject being integrated as opposed to feeling separated from the rest of the piece. 1. Wet the whole sheet of paper with water. 2. Dilute white glue 50% and brush it on the areas you choose to apply the tissue paper. 3. Maintaining the wrinkles and creases, press tissue onto the paper. 4. While the paper is still wet introduce color. 1. Let paint, which has a shiny wet look, begin to dry so that it appears satin. I call this the "magic moment". If you wait too long you miss your opportunity. 2. Sprinkle salt into area you want texture. Wait. It takes a minute or two so be patient. The effect will appear. 3. Dry with a hair dryer and brush off salt. The drying is important because the paper can be dry and the salt still full of wet paint which can smear on your painting. You now have a painting start which is energized with texture. We would love to see examples of your work using these techniques. E-mail to artadventures@aol.com. Your questions or comments are also of interest to us for future "tips".